Tips about Fly Fishing, If you want to go fly fishing for trout, here is what you will need if you want to become a fly fisherman (Fly Rods, Fly Reels, Fly Fishing Vests, Fly Fishing Waders, Fly Lines and Leaders, Fly Assortments, Fly Fishing Sunglasses, Fishing Luggage and Cases to carry your equipment, Fly Fishing Clothing-optional (Fly Tying Kits optional and Materials optional). A good start would be a 9 foot graphite or fiberglass fly rod to allow you to cover the widest range. Add 75 feet of line to your reel if you plan to catch trout that is over 3 pounds. You will need thigh or chest waders, a fisherman's vest with lots of pockets for flies, a knife, long pliers to take the hook out of the fishes mouth, and a fishing basket for your catch. Both wet and dry flies can be used to fish for trout. There are five types of fishing fly categories. The types are wet flies, dry flies, streamers, nymphs, terrestrials and buck tails. Some types are Brown Hackle Peacock, Hare's Ear, Brown Wooly Worm, Olive Wooly Worm, Black Ant, and Coachman. The (dry fly) method is called that because the fly is never dunked below the surface of the water. The fly floats on the surface, and it's slowly dragged or floats down with the current and allowed to do a (dead float), hopefully enticing a fish into believing that a meal is waiting or the fly became unable to fly and is an easy meal. Dry flies are supposed to look like an insect that is floating on top of the water. Using dry flies, you do not want to jerk or pull it to hard, that wouldn't seem natural to the trout, and you want it to look as much like a fly as possible. A Wet fly is the oldest form of fly fishing and they are supposed to imitate flies that are sinking from the water's surface. A Nymph is the stage the insect is at the larva form of the insects. Nymphs usually float just below the surface of the water. Streamers and Buck tails are much larger and imitate larger bait fish. The difference between them is that buck tails are bound with hair and streamers are tied with feathers. 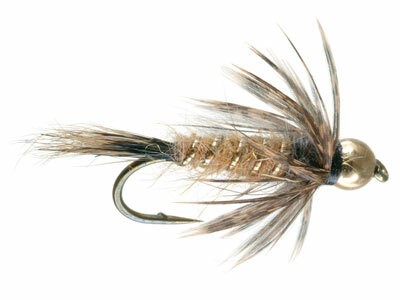 Fly fishing with Angler flies, you will casting out the flies to lure the fish. These flies are made with different materials that are shiny things, yarn, fur, synthetic parachute-type things, and other types of material. Fishing for trout there are lines and rods that are rated by (weight) the standards set by AFTMA (the American Fishing Tackle Manufacturers Association). Weight is measured in the total amount of grains that are include in the first 30 feet of the line, If the fly line is, (5 weight), that means that the first 30 feet of line weighs 150 grains or( 30 grains times 5 grains per foot ). The first 30 feet of a 4 weight line will weigh 120 grains. The smallest unit of measure in the U.S is a grain. 1 lb. heaviness equals 7000 grains. The most popular weights of fly line will range from 4 to 9. fly fishing is certainly one of the most intense type of fishing, it does not resemble other types of fishing, you either love it or you hate it. some fly fisherman spend there whole life looking for that perfect fish.